In France in the decades around 1700, a large amount of chamber music was written and published, which was performed at the court and in the salons of the bourgeoisie. Among the most beloved instruments were the theorbo and the guitar, the viola da gamba, the harpsichord, the recorder and - after 1700 - increasingly the transverse flute. In addition, an instrument like the musette enjoyed an increasing popularity. Most suites and sonatas could be played on various instruments, as the titles of printed editions indicate. The present disc includes pieces by some of the most famous composers of the time in different scorings. At the same time, we can observe here some stylistic developments which took place during the first half of the 18th century. Jean de Sainte-Colombe was one of the most brilliant viola da gamba players of his time. As he disappeared from the public scene after Louis XIV revoked the Edict of Nantes, which guaranteed Protestants some freedom of religion, it has been suggested that he did belong to the Protestant minority. That could explain why he was never in the service of the court. His Suite in d minor follows the traditional pattern: it opens with a prélude, which is followed by an allemande, a courante, a sarabande and a gigue. The courante has a double, a repetition of the courante with melodic variations. The disc opens with the Suite No. 5 in g minor by Pierre Danican Philidor, a member of a dynasty of musicians. Pierre started composing at an early age, and took over his father's position as oboist of the Grands Hautbois. Later on, he became a member of the chambre du roy where Marin Marais and François Couperin were among his colleagues. This suite in fact follows the model of the trio sonata as established by Arcangelo Corelli. It is in four movements in the order slow - fast - slow - fast. The titles of the movements are in French, though. It is notable that this suite omits a prélude. That is also the case with the Suite No. 3 in G by Jacques-Martin Hotteterre. He had the nick-name le Romain, because he had been in Italy for some time, and that had left its mark in his oeuvre. László Rósza compensates the lack of a prélude by playing one from Hotteterre's treatise L'Art de Préluder. This suite reflects a development which can also be observed in the harpsichord music of his time, especially the four books by François Couperin: the introduction of character pieces. In this suite every movement indicates a dance, but with the addition of a title, such as allemande La Cascade de St Cloud and sarabande La Guimon. 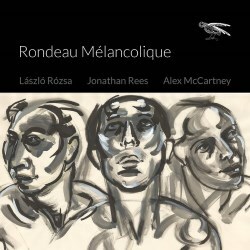 Such titles are mostly impossible to identify for modern performers, but in some cases the character of the music leaves little room for doubt, such as the rondeau Le Plaintif. The rondeau was to become one of the main forms in the course of the 18th century. Robert de Visée follows a more traditional pattern in his Suite in G: after a prélude we hear an allemande, a sarabande and a minuet. Visée was the most prominent theorbo player of his time, but he was also a promoter of the guitar: for many years he was the guitar teacher of Louis XIV. Charles Buterne is a little-known composer; he was educated as an organist. Only a treatise and a set of six sonatas from his pen have come down to us. The title of the sonatas indicates the then most popular instruments, which are suggested as alternatives: Six sonates pour la vielle, musette, violon, flûtes, hautbois et pardessus de violles. Here the Italian influence clearly manifests itself: after a movement called tendrement we get an allegro La Bully which is unashamedly Italian, and closes with a pair of minuets, with the Italian title of minuetto. The disc closes with two arrangements. In his third book of harpsichord pieces François Couperin included a character piece with the title Le Rossignol-en-amour, the nightingale in love. It is for harpsichord with transverse flute. It is played here by recorder and viola da gamba. The nightingale is also the subject of the song by Jean-Baptiste de Bousset. It belongs among the genre of the air de cour, which developed in the 17th century and was at first, as the name indicates, sung at the court, but in the course of time became also popular among the aristocracy and later the bourgeoisie. Couperin also composed some of such songs. They could take the form of an air à boire or an air sérieux. Pourquoy, doux rossignol is an example of the latter and is played here by the three instruments. Chamber music in France under the ancien régime reflected the ideal of a galant conversation. The intimacy of this recording fits that ideal: instead of the harpsichord we hear the theorbo or the guitar as the chordal instrument in the basso continuo. The three artists deliver very fine performances. László Rósza produces a beautiful tone and his performance is characterised by subtlety, for instance in his treatment of dynamics and the application of notes inégales and the flattement (finger vibrato). Jonathan Rees impresses with an intensive interpretation of De Sainte-Colombe's suite; the opening prélude is performed in an improvisatory manner. Alex McCartney plays the suite by De Visée in an elegant and refined manner, with a clear articulation. This disc will give every lover of baroque music much pleasure.